Stocks were driving higher yet again on Tuesday, with the S&P 500 flirting with overbought territory going into Wednesday. However, it coughed up its gains going into the close. Keep in mind, the Federal Reserve will have an interest rate decision and press conference on Wednesday afternoon. 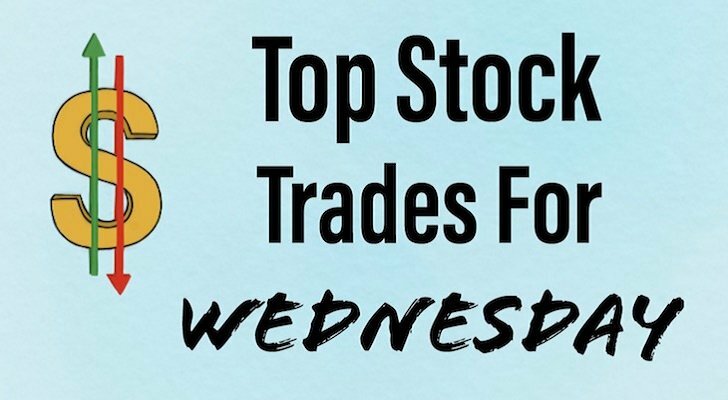 Let’s look at Tuesday’s top stock trades. Shares of Advanced Micro Devices (NASDAQ:AMD) are erupting on Tuesday, up over 11% on the day after a video game announcement from Alphabet (NASDAQ:GOOGL, NASDAQ:GOOG) propelled AMD’s breakout even higher. Now over $25, AMD is hurdling a key level and the stock isn’t even overbought yet. Traders who were long coming into the day should trail up their stop-losses. Prospective buyers should watch AMD Wednesday morning. 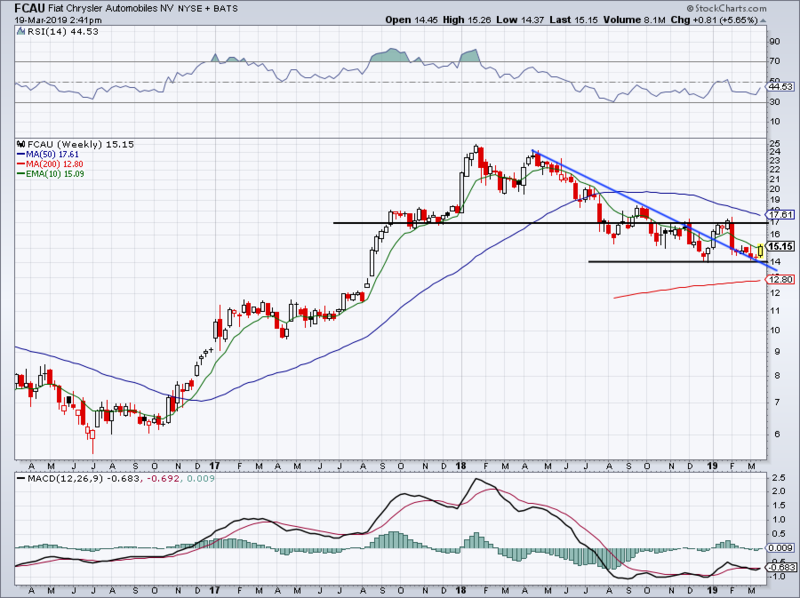 If AMD has a small to modest pullback on Wednesday and $25 holds, it may be an advantageous buying opportunity. Keeping in the chip space, Nvidia (NASDAQ:NVDA) stock is also rallying. However, it’s on the back of the company’s GTC Keynote presentation on Monday evening. With Tuesday’s ~4.5% rally, NVDA stock is easily over $170 and hitting new highs for 2019. While NVDA is more overbought than AMD, neither is near a concerning level for longs yet. I wouldn’t be surprised to see Nvidia continue higher, so long as the Fed doesn’t derail the market rally on Wednesday. On the downside, I would like to see $170 hold as support. 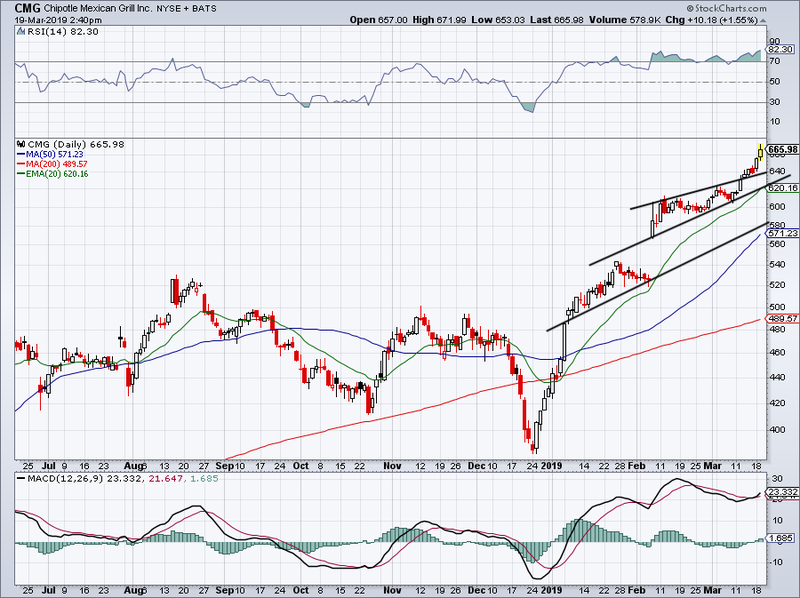 Should it fail, look for the $162.50 area to provide support, along with the 20-day moving average. 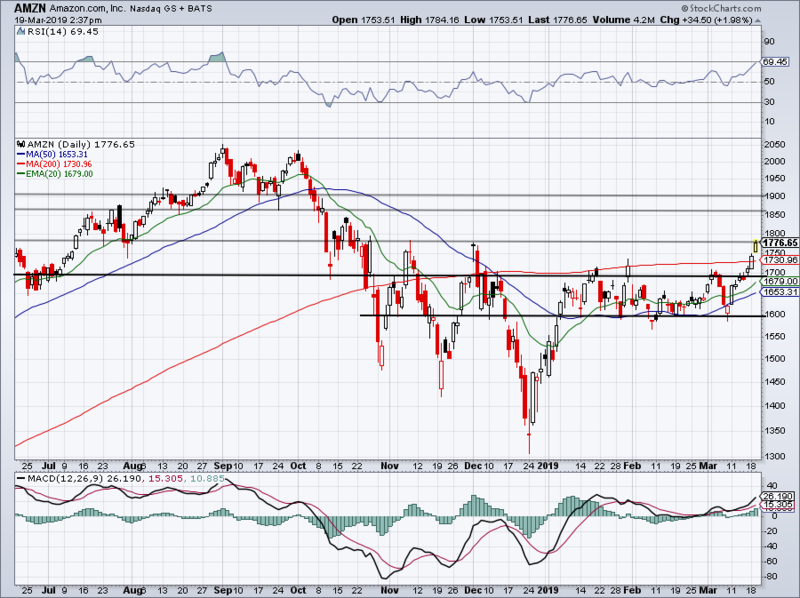 On a further rally, investors can target $188, the 38.2% Fibonacci retracement for the 52-week range. Up near $197 fills the earnings gap from back in November, while the 200-day is up near $209. 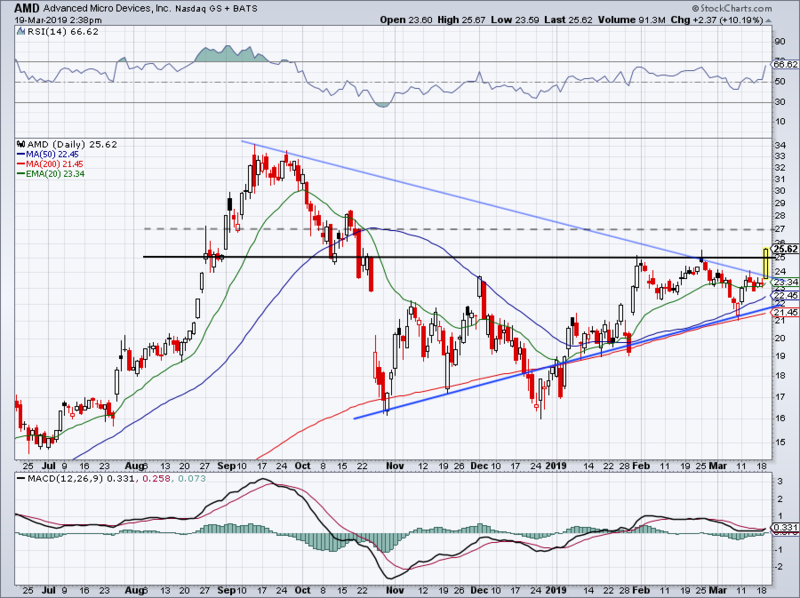 Last week we highlighted a potential breakout in Amazon (NASDAQ:AMZN) and so far this week, we’re getting a big move in Amazon. I didn’t expect that much of a rally, at least in just two trading sessions. If Amazon continues higher from current levels, $1,850 could be on deck. Should we pullback, look to see that the 200-day moving average acts as support. If it does, longs are still okay. Those who came in long should trail up stops and/or book some gains if they’re only trading for the short term. Shares of Chipotle Mexican Grill (NYSE:CMG) have been fire, rallying roughly 75% from its December lows. As much as I love to let the winners “ride higher,” investors should surely consider taking some gains off the table now. At the very least, they should trail up their stops. The stock is overbought and definitely extended. That doesn’t mean it can’t keep running, but the risk/reward does not favor new longs. Short-term buyers can consider buying a pullback to $640, while more conservative bulls will want to wait for a test of the 20-day. The latter is what I want to see. An M&A rumor sent Fiat Chrysler (NYSE:FCAU) higher by 4.5%, however shares are running into the 10-week moving average on the long-term chart. On the plus side, $14 held as support and if FCAU can push through the 10-week moving average, perhaps it can gather some bullish momentum. 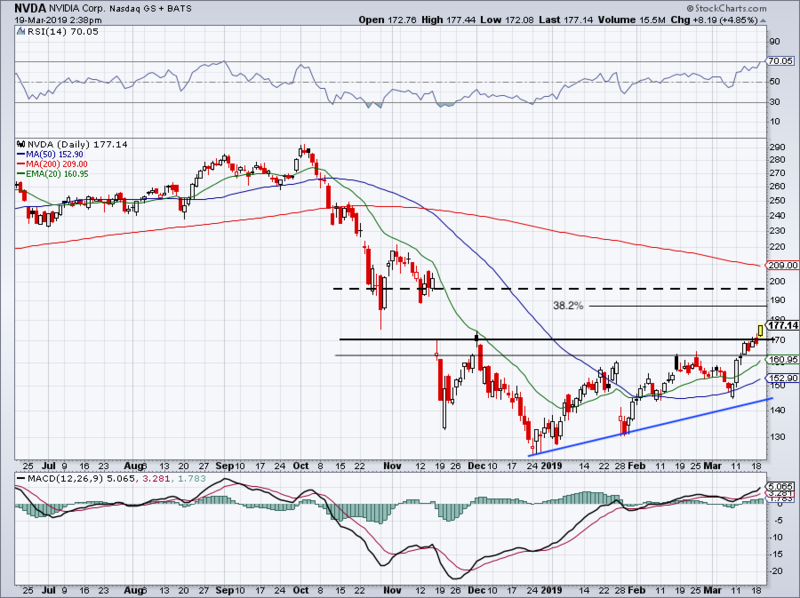 If it can, Fiat stock may run to $17 before running into resistance. Even if that’s the case, we’re still talking about a ~13% return. Not too shabby. Below $14 and I’m concerned for FCAU. Bret Kenwell is the manager and author of Future Blue Chips and is on Twitter @BretKenwell. As of this writing, Bret Kenwell is long AMZN, GOOGL and NVDA. Article printed from InvestorPlace Media, https://investorplace.com/2019/03/5-top-stock-trades-amd-nvidia-amazon-fiat-cmg/.